Streetwise Opera is an award-winning performing arts charity for people who are or have been homeless. They currently run creative programmes in five regions across England and stage critically-acclaimed operas. It all started in 2000, when a resident of the Passage (a homeless night shelter) read out a quote from a politician in the newspaper, saying that ‘the homeless are the people you step over coming out of the Opera House’. The comment made some people angry whilst others saw it as an opportunity – if homeless people were in an opera it would challenge the public’s attitude to homelessness. It would shine the spotlight on achievement rather than need and turn stigma into celebration. Matt Peacock, Streetwise Opera’s founder worked with residents to put on a production of The Little Prince at the Royal Opera House. The show was an immense success, creating transformation impacts in the lives of the people involved, as well as receiving great acclaim from the public. The Streetwise Opera Nottingham team run a weekly session at the Emmanuel House Support Centre every Tuesday afternoon and raise the roof! 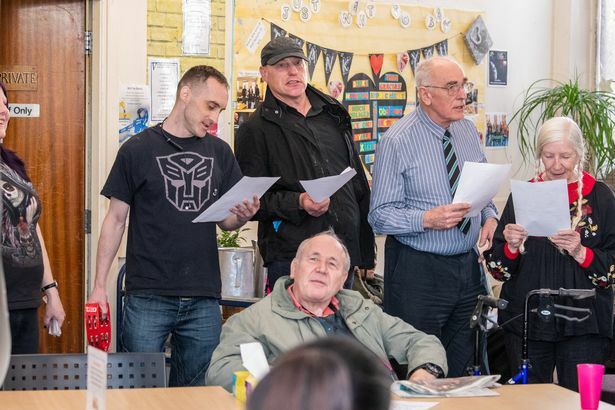 It is certainly a highlight in the week and beneficiaries, volunteers and staff all enjoy the benefits of singing and hearing the ‘powerful, authentic and raw passion and epic emotions from everyday life’. The workshops are run by Neil Allen and Tim Lole, with support from Gary Drewry, Emmanuel House staff member among others from Streetwise Nottingham, who together form a dynamic and creative group. One of our beneficiaries recently came to the centre having lost his job and housing. Aaron had hit rock bottom when he arrived and hardly had the will to go on. He wasn’t alcohol dependant, he had not been doing drugs, he had unfortunately lost his job and so his accommodation quickly followed. He was one pay check away from homelessness. Sadly, this is the story for many, fortunately Aaron was pointed in the right direction to Emmanuel House Support Centre to receive a warm welcome, hot drinks and food, a change of clothing and the specialised 1-1 support to begin navigating the benefits and housing systems. Aaron is looking forward moving into his own tenancy in the near future and he will be performed alongside others at: The Opera Hour at Nottingham Trent University on Thursday 21st March. ← 238 items of warm clothing donated by The Nottingham!